I just had to give a shout out for yet another wonderful “green” product. I am loving my new 40oz. stainless steel drinking container from Klean Kanteen. 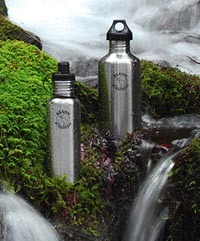 I have been going walking and hiking more now that the weather is cool and I don’t have to worry about snakes in my backyard…so instead of carting along a plastic watter bottle I decided to make the transition to stainless steel which is durable, toxin free, and non-leaching. They come in a ton of sizes from 12 OZ ($17.95) which is perfect for little hands, or your purse, 18 OZ ($15.95) which is great for the gym and the jumbo size 40 ouncer ($23.95) when you are really thirsty. They come with sports tops, flat tops and loop caps. Overall they are much better for the environment and for the health of your family so ditch those nasty plastic drink containers already!